Possibly one of the most recognisable campaigns, Coca Cola’s Share a Coke campaign was kicked off in Australia in 2011 but has since spread and is internationally recognisable. It was introduced to the UK in 2013 and was a fun interactive way of encouraging people to buy the drink, as people could feel a personal connection to bottles with their names and thus buy a refreshing beverage for the summer heat. In 2014 more than 150 million personalised bottles were sold, with over 1000 different names being available. This ad features people going about their daily lives in a Caribbean town but they are stuck in a loop, until they drink some Bacardi and are able to break free of it. The bright, popping colours and upbeat music capture the spirit of summer perfectly, making it a great campaign. The ad was also innovative in its use of Boomerang-like loops, which are popular on Instagram, making it feel more relevant to a wider audience. This was an experiential marketing campaign that took advantage of the summer by getting people involved in activities, most notably a giant waterslide to which people were encouraged to bring inflatables and slide through London. It was memorable as an engaging and fun campaign that got people to interact with the brand in a way they surely won’t forget for a long time. Other activities in the campaign included film screenings and DJ sets. 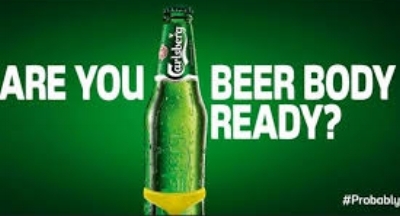 After a controversial ad from Protein World asking women if they were ‘beach body ready’ (an ad which made 61% of women feel insecure about their bodies and was banned by the ASA), Carlsberg responded with an ad that turned this on its head and asked people if they were ‘beer body ready’. This was a strong campaign as it tapped into the popular idea of having to be physically ready for summer in a humorous way that didn’t create insecurities, and provided a remedy to a controversial campaign that did. It was made even stronger by the fact that the Beer Body Ready ad was placed next to Protein World’s offensive ad, making it even more striking. While it’s true that summer is essentially over now, it’s never too late to be inspired, and these ads show how to use the situation around you (whether that the season, Instagram trends, or controversies that can be turned in your favour!) to make the best campaign you possibly can.